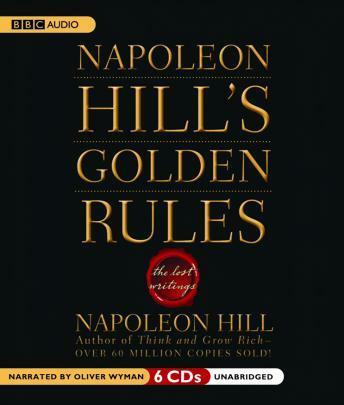 Napoleon Hill's Golden Rules: The Lost Writings consists of a series of magazine articles Napoleon Hill wrote between 1919 and1923 for Success Magazine. Hill's obsession with achieving material success led him out of the poverty-stricken Appalachian Mountains and filled him with the desire to study successful people. These articles focus on Hill's philosophy of success, drawing on the thoughts and experiences of a multitude of rags-to-riches tycoons, showing listeners how these successful people achieved such status. Hill's popularity continues to this day, as many of his writings, such as the chapter on Law of Attraction, have recently become the basis of several bestselling books (including The Secret!). Discover the principles that will assure you success!